I hope you had a nice weekend. It was much better weekend for me as I went for fishing with my friends. Overall, it was good. Okay, back to the topic. 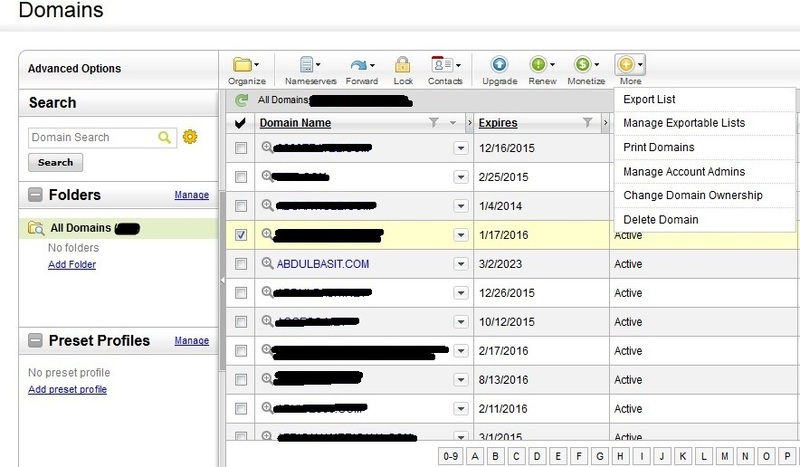 I actually found GoDaddy coming up with new domain control panel / domain manager with more great features and user-friendly access. It looks clean and smooth. I like many things about the new release of domain control panel. One of the best thing is I can see all my domains at once page and don’t require to go on Page 2, 3 and so on. Simply scroll down at the bottom of your domains list and it will show all domains. Also when you click on any domain like it shows in above snapshot you can scroll your move over “More” options to get several shortcuts more quickly. You may click the picture to enlarge it. Another thing I like is the whole page doesn’t refresh when you make any changes to the domain. Only the domains area gets refreshed and that too very quickly as compare to the previous control panel where whole page used to load and had many complaints of having the control panel operating too slowly. Overall, I am very happy with the new features, the look, swiftness, etc. And one last thing which was really time saving and cool feature is to find the domain from the starting letter you wish to search. As you can see in the screenshot right at the bottom which says 0-9 A B and so on… If you click on letter “K” it will show the domains start from K. You don’t need to scroll to page 2 or 3 where your domain starts from K.
Have you tried using their new control panel yet? How is your experience and would rate it? Have I missed anything which is more useful feature in their new release?